In this blog we will get some basic information about MVC. 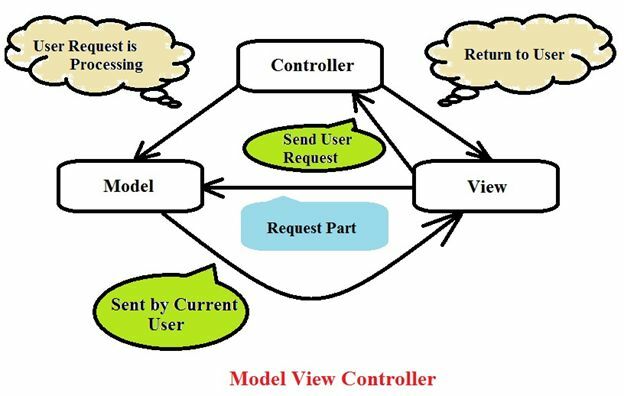 Model View Controller is a type of user interface architectural application. There are three parts of the MVC and each part has his specific work. All data related work in this part. It is used for data transfer between view and controller. Data Model: Any applications interact with the database. Business Model: Work with Data Model and save data in database. View Model: Pass information from controller to view. View means in simple word Action Part of application. Two part of views are in ASP.NET MVC. This is User Interact Part. Means it is a client or a customer side part. Controller is work between view and model for business logic and request. Controller is a working with a HTTP request from User Side. MVC is a type of ASP.NET framework. In MVC framework any web application development use MODEL, VIEW and CONTROLLER. In this you are also using security, session, state management, etc. because MVC is a part of framework. Many improvements were seen in this .NET Framework by Microsoft through its main purpose of designing, testing, maintainability, clean structure, etc. Model is representing the application part and implements the data logic. View is representing the User interface part and display data on browser using Controller part. Controller is classes. In this part collect user Request. Easy to manage and test because every functionality is a separated part of Model, View and Controller. Default HTML5 templates for Visual Studio and Mobile Application. Automatic selection of rendered views means application auto set in Desktop/Mobile/tablet browser. Microsoft Windows Azure SDK support for deploying ASP.NET MVC applications to Windows Azure. Social site authentication like Facebook. I hope you are getting basic information about MVC. We will get more information in next article with some example.